The Avocent CCM4850 console management appliance provides secure serial over IP console access. The Avocent CCM4850 48-port console switch expands Avocent DS Series patented, field-proven KVM over IP technology with secure access to local or remote serially-managed devices. Avocent DSView3 management software provides easy local or remote management of CCM appliances. Complete KVM, Serial and Power Management Solution: CCM4850 works in unison with other Avocent KVM switches and appliances to enable administrators to manage a wide range of data center devices through local access at the rack or by remote access through KVM over IP connections. Ease of Management: Avocent DSView3 management software provides easy and secure local or remote management of CCM appliances. Security: The Avocent CCM4850 secure console server appliance offers internal and external user authentication methods and port-specific access rights. Ease of Access: For administrators that prefer GUI-based session launching, Avocent's management software provides an intuitive, explorer-like interface to organize servers into logical groupings and permit session launching via a simple mouse click. With support for custom folders, labels, and icons, it is no longer necessary to recall cryptic machine names or IP addresses. Scalable: The Avocent CCM4850 console switch appliance architecture is scalable rather than stackable; there are no restrictions on the number of CCM appliances that can be added to an installation. 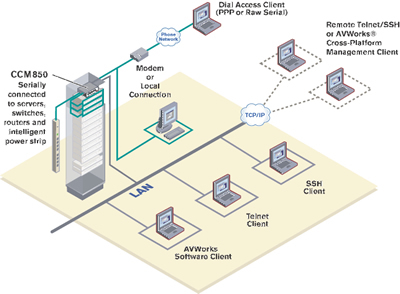 Non-blocked Access: The Avocent CCM4850 serial console server architecture supports simultaneous sessions to all serial ports. Solaris Ready: Hardware break suppression ensures uninterrupted operation of Solaris servers even if power is lost to the CCM appliance. Break Generation: Hardware break, sometimes referred to as STOP-A, may be intentionally generated via Telnet or SSH clients. Port History: Port history functionality includes offline buffering, string search and various modes to save or clear onboard history buffers. Direct Port Addressing: Sessions may be established directly to any CCM appliance port by using SSH to bypass the CCM command line interface. Type Ethernet: IEEE 802.3, 10BaseT. Fast Ethernet: IEEE 802.3U, 100BaseT.